Yeah! 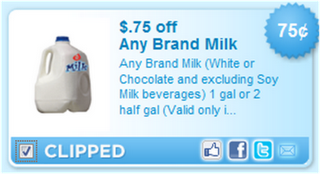 If you live in Utah or Idaho, coupons.com has reset the $0.75 off any brand milk, 1 gallon or 2 half gallons, coupon. This has saved our family a lot on milk this past year. Pass along this info to your friends and family. And remember to print it twice.